Paintertainment: When can I call myself a "PROFESSIONAL" face painter? When can I call myself a "PROFESSIONAL" face painter? "When can I consider myself a PROFESSIONAL face painter?" The short answer to this question is that if people are paying you for your time and talent, you are a professional. 1. You are a talented artist, or at least a determined student. Having a natural talent for art is an obvious one when you are looking to be a professional artist. There are, however, exceptions to this rule...I do know of some artists who were not naturally artistic and are still amazing face painters. It just takes a LOT of work and practice to perfect the techniques of clean linework, teardrops, one strokes, etc. If you are not a natural artist, you'll find yourself focusing greatly on technique and the delicate science of structure and layout of your designs. You will benefit greatly from conferences, workshops, and step-by-step's. While this may make or break your decision to go pro, don't get frustrated too early on...just know that you have a long road ahead. If you have enough passion, you'll get through. I liken this to myself with the piano. I knew kids who played flawlessly by ear when I was growing up, and who couldn't read a note of sheet music. I went to weekly lessons for 10 years and can play some songs really well, but only after months and months of practice on every song. I am NOT a natural musician. But if you heard me play one song I know well, you might THINK I was and that's all that the client sees when you're hired. 2. You invest in quality supplies. Some painters start as volunteers, being provided craft paints. Many painters start out with actual face painting kits from their local craft store...then the first time they try out a more professional set, they are floored by the quality and never turn back. Even the most talented, seasoned professional will struggle to create beautiful art with crummy supplies. Whatever paints you use, it is of utmost importance that you ONLY use makeups made with ingredients that are FDA compliant for cosmetic use, including your glitters, for the safety of your customers. Click here for an in-depth article on the importance of using safe products. Your brush quality is also very important for achieving clean linework. Good, quality brushes do what YOU want them to do, not what THEY want to do. My kit contains around $1,500.00 worth of paint and tools at an average event, and that doesn't include all the specialty tools I may leave at home for other specific events. You don't need THAT much paint to start out, but you do need quality. It's better to start with a small amount of quality tools than a big box of cheap supplies. Click here for a special package deal on the basics that I recommend for those who are serious about going pro. 3. You paint people you don't know. When you are just starting out, chances are you will start by painting people you know...your own kids for Halloween, your niece or nephew's birthday party, or volunteering at your church or kids' school events. Once you realize all of the time and expense that goes into good face painting and decide your skill level is enough to start charging, it's time to seek out actual clients. Many artists feel like they've "arrived" once they book a party of someone they don't know. There's something validating about having a total stranger willing to pay you to do something, knowing they aren't just hiring you because you are related and they want to help you out. 4. You have an online presence. This is not something that has to cost you a lot of money to start. Start with a Facebook business page or a blog for free. These days a professional MUST have some sort of address in cyberspace where clients can find their contact information, samples of their work, FAQ's and client testimonials. Spend $10 on Vistaprint to get yourself a set of business cards to hand out to potential clients. You can't reach point #3 without having some way for those strangers to get ahold of you! 5. You do your research. If you are serious about becoming a professional face painter, you will do your research on the profession. 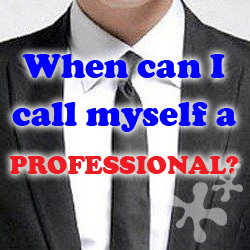 (and yes, it is an actual full time profession for many!) You will seek out more knowledge and skills by joining face painting related Facebook groups (don't be alarmed by the VAST NUMBER of face painting groups! ), you might purchase books to learn new skills and designs, you might attend local face painting workshops and jams. You will invest in a practice head, wipe-off practice sheets, or chase down every child in sight and get to the point of bribing your kids to let you paint them AGAIN. You might go as far as to attend one of the many national and international face and body painting conventions, or subscribe to FABATV to continue your learning. Or, you may simply scour Youtube or our learning page for free tips and tricks. However you choose to learn and grow, professional face painters never stop doing this. We are always striving to learn the latest techniques, whether we decide to adopt them into our methods or not. It is a true sign of someone who is passionate about what they do. Most "professional" face painters have liability insurance. If you don't have it yet, as long as you are growing your client list, sooner or later it will be required of you. Most fairs and festivals require that you have at least several million dollars of coverage (and will require an insurance certificate with them listed as "additional insured), and that is what gave me the nudge to get insured. 18 years ago when I did my first county fair, I needed insurance. Many corporate clients will only hire insured artists as well. 7. You have an established business name. I've been going by the name Paintertainment for most of my 20 years in the business, and have owned Paintertainment.com for 18 years. However, I did at one point have to actually register my business name with my secretary of state in order to keep one of my long time clients (a government gig). They would not issue a paycheck to me otherwise. It cost me about $250 in the end to register my name. (About $30 for the actual registration...the rest was the cost to be published in a legal newspaper for 2 consecutive weeks which is required to make your registration valid). That sucked up most of my profit on that year's gig, but has enabled me to keep getting that annual job and also protect my business name. 8. You charge the going rate. Many-a-full time face painter have been hurt by people who paint "just for fun" or "on the side" at insultingly low rates. Of course it IS good practice to charge less when you are just starting out and trying to gain experience...as long as you let your clients know that and aim to raise your rates. (for example, let customers know this is an introductory rate that is only good for so many months, then your rate will be going up. Or run a promotion where if you book 1 hour, you get one free, for a limited time.) Undercutting hurts us all because it brings down our perceived value and worth with the community...something that professional painters work very hard to uphold. For an in-depth article on what to consider when figuring out your rates, click here. If you have any plans to continue face painting for income, it's not a matter of IF but a matter of WHEN you will absolutely need a written contract. It is smart to start using one as soon as possible, before you feel you need one, because the situation that forces you to realize it is a must will most likely not be a pleasant one. Contracts are not only important to protect you, but your client as well. Managing your clients' expectations can prevent 90% of the things that go wrong in our business, and nothing helps manage expectations like putting things in writing! Click here for some suggestions as to what to put in your contract. 10. You know your worth. Don't expect clients to see and understand your worth and value if you don't yourself. Having confidence in your pricing and your own booking processes can take some time to build up when you're new, but you don't have to let your clients know this. When asked for their price, a professional gives it with confidence, and is willing to walk away from clients who are not willing to compensate them for their time, investment and abilities. Professionals don't cave under the client's pressure to paint for a reduced rate or a crowd they can't handle...they recognize that clients contact them because THEY are the face painting experts, and they educate their clients as to what is needed for their events to be successful...not the other way around. Not ALL of these things are required to call yourself a professional. (Although I'd be willing to argue that #1-5 are required!) It took me a few years to realize I needed insurance. I didn't use contracts for years. Over time I learned these lessons the hard way. But in my opinion, and it's only my opinion, as long as you at least are aware of all of these things and have them all as goals in your near future, you are a professional. You take your business seriously for what it is...a business that deserves your time, attention, and respect in order to thrive. Thank you so much for your continued help and encouragement. I'm sure I'm not the only one passionate to paint but not confident in my skills. I welcome every opportunity to paint as I gain experience but go from excitement to anxiety as the event draws near. After the first couple of faces, I begin to relax and actually have so much fun. I am a painter much like you as the pianist, great analogy. I will continue to paint on, painting happy faces wherever I can. It's people like you who will turn "wanna-be-face-painters" into professionals to paint a little more joy into the world!